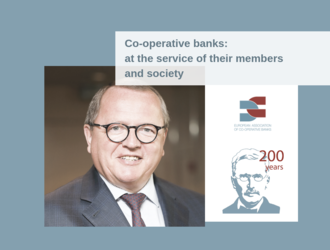 This interview is part of the booklet: "Co-operative banks: at the service of their members and society - 200 Years after Raiffeisen’s birth. The omnipresence and contemporary relevance of Raiffeisen’s principles in banking" published by the EACB and TIAS University on the occasion of the 200th Anniversary of Friedrich Wilhelm Raiffeisen, one of the fathers of the co-operative idea. Could you briefly describe the origins and historical milestones in the development of your co-operative banking group? Cera’s roots go back to 1892, when the first Raiffeisenkas was set up in Rillaar by Jacob Ferdinand Mellaerts (1845-1925). Back then, the organisation’s articles of association were by and large a translation of those published earlier by Friedrich Wilhelm Raiffeisen (1818 - 1888). In this manner, Cera became an important link in spreading the Raiffeisen concept outside Germany. What began as a small, local savings guild would grow to become one of the biggest financial institutions in Belgium. More precisely, from an agricultural savings and credit institution, Cera developed into a general bank with activities in retail, SMEs, the corporate sector and community services. It provided a full range of banking products and services, including mortgage loans, savings, payments, investment funds, asset management and corporate finance. In 1998, Cera’s banking activities were incorporated into KBC, a newly-established integrated banking and insurance group. On that occasion, the federation of 207 local banks with a co-operative structure were absorbed by Cera Head Office. All members of these local banks then became direct members of Cera, thereby establishing one single strong co-operative. Also, through this transaction Cera became a major shareholder of KBC. Today, Cera and its subsidiary KBC Ancora are the largest shareholders of KBC Group, together owning 21.2% of KBC. KBC is a bancassurer with 5 core markets, 1,600 bank branches, more than 40,000 employees and holds approximately €275 billion in total assets. Could you briefly elaborate on the mission and vision of your co-operative banking group? - Members of Cera qualify for unique benefits. Raiffeisen’s values of co-operation, solidarity and respect for all have been underpinning Cera’s entrepreneurial approach for 125 years now. With its baseline of ‘Cera. Deep roots, broad presence’, the co-operative emphasises its rich history and strong base as well as its wide-ranging and diverse activities in the financial, economic, social and societal spheres. What are the key features with respect to membership and governance? Cera has around 400,000 members, with each one investing a minimum of €1,250 (25 shares of €50) and a maximum of €5,000 (100 shares of €50) in the company. The Management Board has 20 members, 14 of whom are elected from the membership base. The chairman and the two vice-chairmen of the Management Board are elected from among these 14 members. There are six other directors, including two managing directors, three external directors who have been appointed for their specific, complementary expertise and one director who is also a member of the management committee. The majority of these directors are also members. The General Meeting to which all Cera members are invited. This draws around 1,500 attendees each year. 45 Regional Advisory Councils, each with 15 to 25 members and just under 1,000 members in total. The advisory councils cover all of Belgium and include Dutch, French and German-speaking members. The National Advisory Council, which has four representatives from each of the Regional Advisory Councils (chairman, vice-chairman and two member representatives), plus the 14 directors from the membership base and the two managing directors. Together this comes to 196 members. The Management Board, which has 20 members in total. Members and their representatives who are members of the Regional and National Advisory Councils also regularly participate in steering and sounding-board groups and other consultative bodies. Members are regularly informed about what’s going on at Cera via the CeraScope and CeraSelect magazines, e-zines and also messages published on the website. This ensures good top-down, as well as bottom-up information flows. As such, consultation and participation are firmly established within the structures and operation of the co-operative group. Looking ahead, what do you consider to be opportunities and challenges for your co-operative banking group? The zeitgeist is beneficial for organisations like Cera, since the co-operative is helping to create a more sustainable society with its values of co-operation, solidarity and mutual respect.Continuous awareness of the need to broaden and rejuvenate the membership base is an essential condition for ensuring a dynamic co-operative structure over the longer term. An extensive membership base gives Cera legitimacy and the strength to fulfil its role in the economy and society in general. To start with, there is the contribution made towards developing the strategy of KBC and the bancassurer’s supervision. Together with the other stable shareholders, Cera supports KBC in its role as a benchmark bancassurer and also in having a positive influence on society. Involvement and the active engagement of members must also be given a contemporary and future-oriented interpretation. Direct human contact – such as with the operation of the advisory councils or taking part in member benefit activities – will go hand in hand with the use of new media and communications technology. In the future, members will also be able to benefit from attractive and wide-ranging discounts on products and services. After all, the power of collective purchasing has traditionally been one of the great advantages enjoyed by co-operatives such as Cera. These discounts have proven to be a very tangible and appreciated benefit among Cera members. Moreover, Cera also endeavours to distribute an attractive annual dividend as financial compensation in return for members’ investments.